(Newser) – A North Korean missile launch likely failed on Tuesday, according to South Korea's military, the latest in a string of high-profile failures that somewhat tempers recent worries that Pyongyang was pushing quickly toward its goal of a nuclear-tipped missile that can reach America's mainland. South Korea's Yonhap news agency reports that the missile was a powerful midrange Musudan, per the AP. 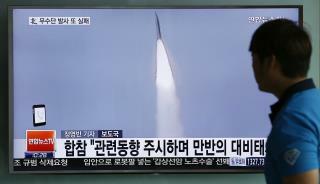 If true, that would make it the fourth failed attempt by the North to conduct a test launch of the new missile, which could potentially reach faraway US military bases in Asia and the Pacific. Yonhap, citing an unidentified government source, says the missile exploded at a mobile launch pad as soon as the launch button was pressed. The report, if confirmed, suggests the missile may have even failed to lift off. Looks like Porky Un has a stamina problem; he keeps popping off too fast..
Photo caption: Mr. Spock watches a TV news program about a North Korean missile launch in Seoul. Now I see why NK loves Trump. They are both failures and can only saber rattle.